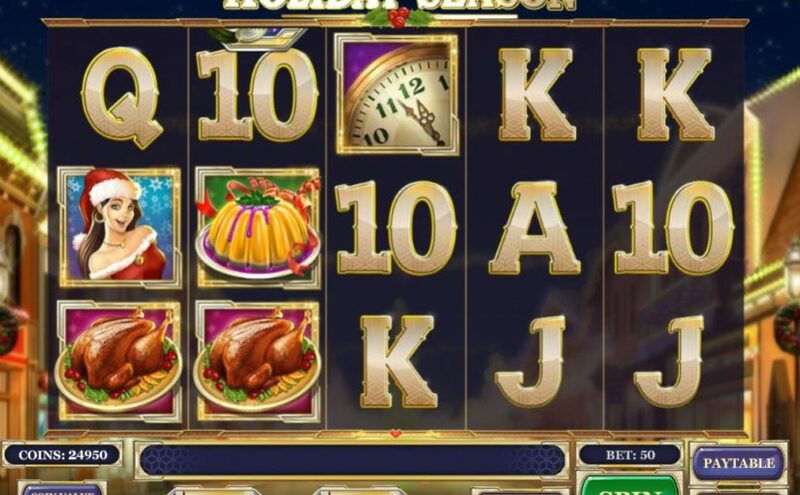 Holiday Season is a 5-reel, 10 payline online slot powered by Play’n GO. Win by lining up plump roast turkeys,sweet figgy puddings, festive party goers and other symbols of joy and merriment. The holiday gift serves as a wild symbol that covers all three positions on a reel to help you unwrap even more valuable surprises. When three or more bottles of champagne appear scattered about the reels, you will trigger the free spins feature and 5 win spins will be awarded. There is a guaranteed win on every spin. A scatter on the reels during the feature will award an extra 2 win spins. The feature can be retriggered up to a total of 3 win spins.